“Dakar TOMA”, “TOMAZILLA”, “At-At TOMA”, “TOMAdurma”, “Çapulsavar”, “TOMAĞĞĞ”… What’s your favorite TOMA? 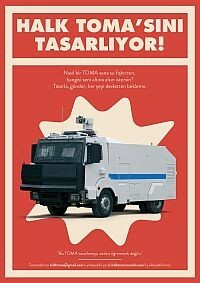 TOMA – acronym for Intervention Vehicle to Public Events in Turkish – has inspired Gezi Park activists to launch a mock campaign where people are to design their own TOMAs. Initiated under slogans like “Don’t expect everything from the government” and “We won’t learn how to design TOMAs from you”, the mock campaign continued with full swing. Several themes related to Gezi Resistance filled up the campaign website including penguins, çArşı, external forces and LGBTs. Other notable themes were as follows: classic, automat, green, retro. 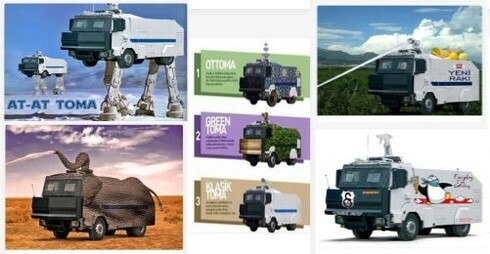 Many theme names were also aimed to mock with police violence and PM-supporters including “Dakar TOMA”, “TOMAZILLA”, “At-At TOMA”, “TOMAdurma”, “Çapulsavar”, and “TOMAĞĞĞ”. During Turkey’s Gezi Resistance, several strategies have been developed by protestors to prevent TOMAs from working. While some protestors spilled olive oil on the street, others responded TOMA water cannons with hones. Few blocked streets with buses or stopped trucks providing water supply to TOMAs. The mock campaign coincided with Turkish government’s silent plans to purchase new TOMAs – a sign that Gezi Resistance has yet to lose its humorous aspect. Many consider the mock campaign as a funny alternative of resistance. “We will ask people even when we will change the location of a bus stop,” Istanbul mayor Kadir Topbaş said. It is yet unknown whether people are competent to choose their own TOMAs. “People are designing their TOMA”, Istanbul is choosing TOMA” and “What is your TOMA?” banners aimed to promote the campaign.